Seattle’s high-density census tracts cover less than a quarter of the city’s land area, but they have absorbed more than 70 percent of household growth this decade. There are, in a sense, two Seattles. One Seattle is under constant construction, teeming with newcomers, densely populated and increasingly urban. The other Seattle is made up of sleepy enclaves of single-family homes, cloistered away from all the action, and nearly indistinguishable from the suburban areas that surround the city. This bifurcation of the city is not random, and it didn’t happen organically. 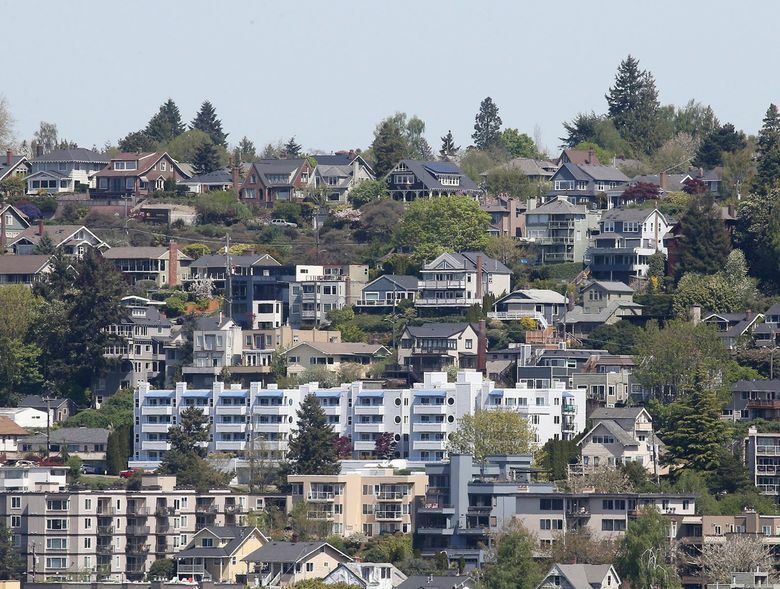 As a report released this past week by the Seattle Planning Commission makes clear, it’s the result of strict zoning laws that allow rapid growth in a small number of neighborhoods while severely limiting it in most. Seattle’s recent growth spurt exacerbated this division, with just 13 percent of the city’s land area absorbing more than half of the total population increase since 2010. I explored Seattle’s wildly uneven pattern of growth among city neighborhoods in a previous column. But it’s not just the number of people that is growing unevenly. Other demographic changes are happening much more quickly in the dense parts of Seattle than in the areas zoned for single-family homes. I explored some of these changes using new neighborhood-level data, released this past week by the U.S. Census Bureau. I divided the city’s census tracts into two groups: high-density and low-density. I used 11,000 people per square mile as the cutoff between the two groups, which is, admittedly, somewhat arbitrary. But it includes most of the parts of the city that are zoned to allow for significant growth. These high-density tracts cover most of central Seattle, and more urban neighborhoods like the University District, Ballard, Columbia City, the Junction in West Seattle and others. Combined, the high-density tracts cover less than one-quarter of Seattle’s land area, but they’ve absorbed more than 70 percent of the city’s household growth since 2010. The Seattle Planning Commission report points out that “large portions of Seattle that are restricted to one house per lot are quickly becoming more expensive, excluding many people.” That’s an indisputable fact — if you can’t afford a single-family house, you can’t live in the neighborhood. The parts of Seattle that provide a wider range of housing options have welcomed many more new residents. Unfortunately, though, the data show that these areas have also become increasingly expensive and exclusive. In high-density areas, half of households now have housing costs exceeding $1,500 per month, up from less than one-third at the start of the decade. That’s a much faster rate of increase than in low-density Seattle. And while the low-density areas still have a higher percentage of households spending that much on housing, the gap between the two Seattles has shrunk dramatically. The city’s skyrocketing rents have contributed to this change, as the high-density areas are dominated by renter households (69 percent are renters). Seattle as a whole has become a more affluent place this decade, but the percentage of high-earners has increased at a faster rate in the densest parts of Seattle. The new data show that one in five workers (full or part-time) living in high-density areas has a salary of $100,000 or higher, up from one in 10 at the start of the decade. There is no longer any difference between the high- and low-density areas in the share of workers earning six figures. Seattle is also becoming a more racially diverse city, although it’s been a slower process here than in some of our neighboring communities. In Bellevue, for example, people of color now make up half the population. Still, census data do show that Seattle has diversified this decade, and it is now less white than it’s ever been in modern history. Diversification is happening faster in the high-density areas of Seattle, although not by much. In both sections of the city, people of color made up 33 percent of the population at the start of the decade. That percentage went up by two points in the dense areas and by one point in the rest of the city. It should be noted that even as the city becomes more diverse overall, some neighborhoods have lost people of color in this period. This is happening in a number of high-density neighborhoods experiencing gentrification, including the Central District, the Chinatown/International District and North Beacon Hill. And it’s also happening in some low-density neighborhoods, like Mount Baker and Beacon Hill. Even so, the data show that many other areas have become significantly more racially diverse, even as they’ve become more affluent. Most of these diversifying neighborhoods have high population density, such as the University District, Lower Queen Anne, Belltown, South Lake Union and Capitol Hill. 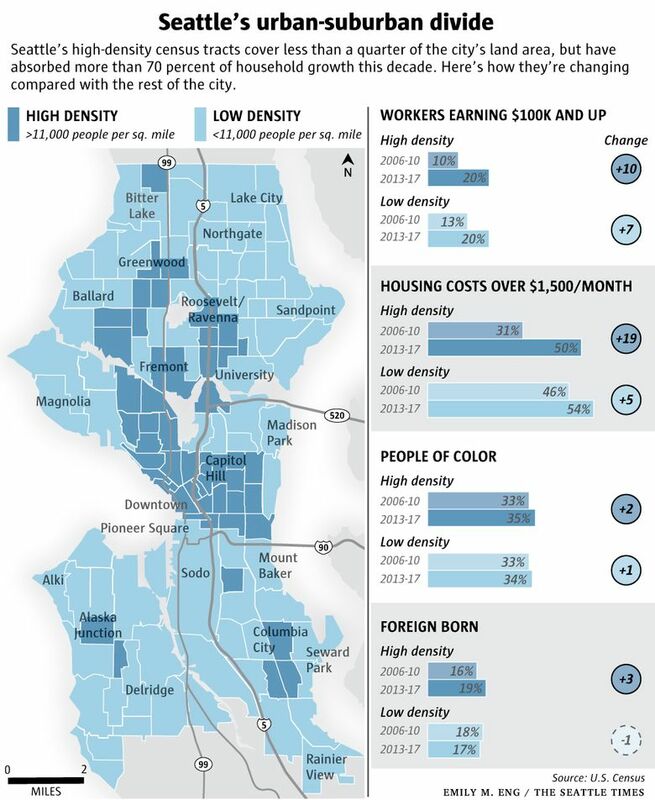 The densest parts of Seattle are also absorbing immigrant populations at a faster rate. The percentage of foreign-born residents in these areas grew by about three points, and now make up 19 percent of the total population. In low-density Seattle, on the other hand, the reverse has happened. The share of the population that is foreign born has actually dipped slightly and is now at 17 percent. A note on the data: The Census Bureau estimates are based on an average of five years’ worth of data, which is done to increase the sample size. So the 2017 data release is actually an average of numbers from 2013 to 2017, and the 2010 releases averages 2006 to 2010.